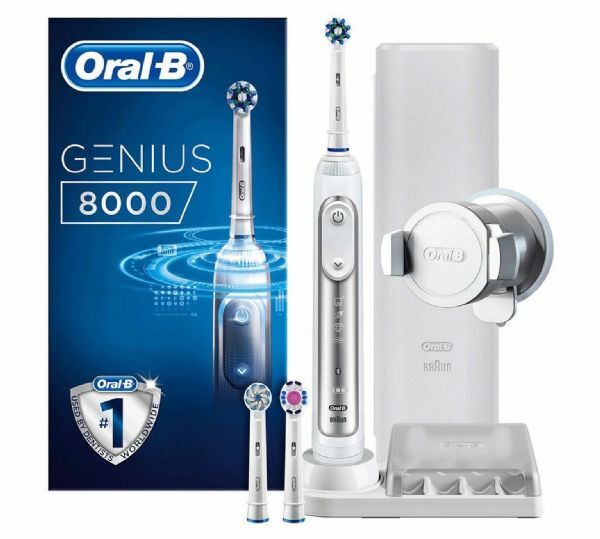 For a superior clean, choose the Oral-B GENIUS 8000 electric toothbrush. It's advanced Position Detection technology allows you to see where you're brushing so you can adjust your technique and improve your brushing habits. Download the App and use Bluetooth to get real-time feedback while you clean. Its LED SmartRing can be illuminated with your choice of 12 colours as you brush. It helps remove surface stains with its polishing cup and its Triple Pressure Sensor protects your gums from over-brushing. The brush head surrounds and cups each tooth with dynamic oscillating, rotating and pulsating movements. It will remove up to 100% more plaque than a manual toothbrush. Its cutting edge lithium ion battery charges with lightning speed. Model number: Oral-B Genius 8000. 5 cleaning modes: sensitive, whitening, massage, polish and deep clean. 3 brush heads: crossaction, 3D white, sensitive clean brush head.